Vanessa and Blake’s garden Tampa Bay wedding featured an outdoor ceremony with white lantern accents and a bright coral color palette. 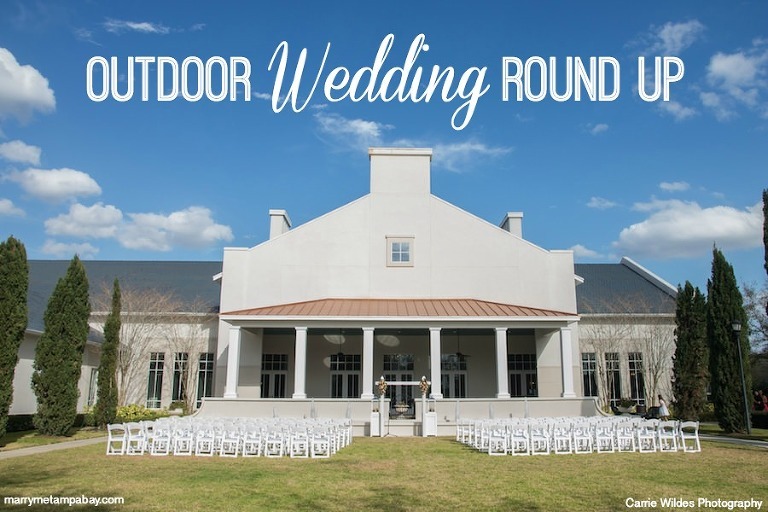 To complement the spring theme, the Brandon couple searched for an outdoor Tampa Bay wedding venue with an indoor ballroom. “I chose The Palmetto Club because of the set up of the venue, their immediate welcome, as well as the location. 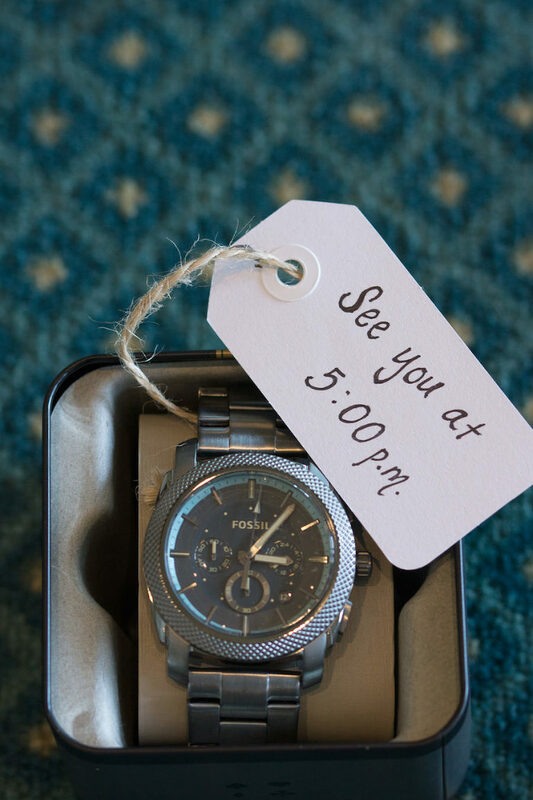 It was a perfect background for pictures,” the bride gushed. 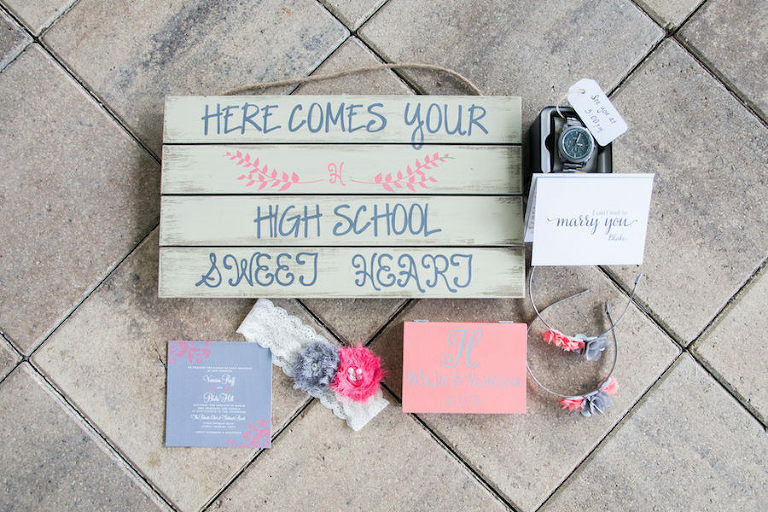 The high school sweethearts looked for a Tampa Bay wedding photographer who could capture their wedding day as it unfolded. Our theme was high school sweetheart with a touch of fishing. My husband and I met in high school in 2001 and fishing is a hobby we have in common. Our colors were coral and gray. 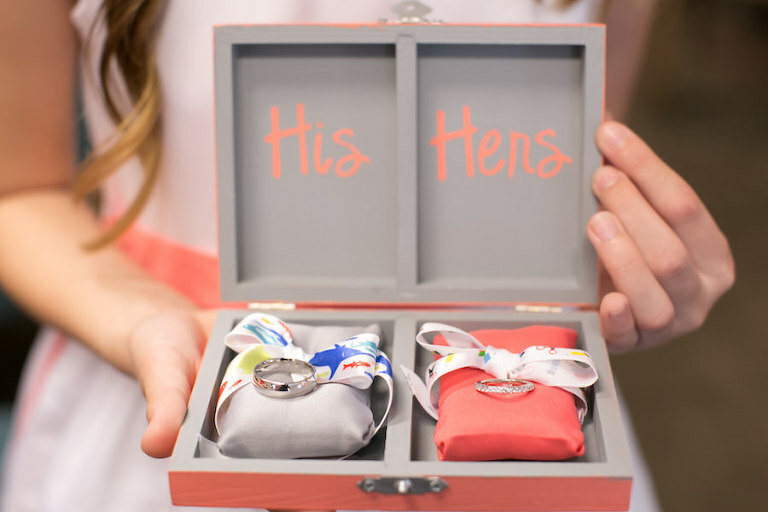 I chose them because I always envisioned a spring wedding and those fit my image. Also, the coral matched all of my bridesmaids’ skin tones. I looked for a venue that would accommodate an outdoor ceremony and an indoor reception. I also looked for something that was elegant, but not over our budget. I chose The Palmetto Club because of the set up of the venue, their initial/immediate welcome, as well as the location. It was a perfect background for pictures. I wanted a photographer who would capture our wedding for us just the way we imagined it in pictures. I wanted someone who had an a love and passion for photography. I hired Carrie Wildes Photography because of their presentation, customer service and galleries. Carrie took her time and didn’t rush us when we met for a consultation. She didn’t try to pressure us into her services and was very patient. She was very welcoming, helpful and friendly. I was absolutely, 100% satisfied with her services. Megan and Santi celebrated their Bradenton wedding at a private residence, surrounded with live oak trees and flowers. The hometown couple, who grew up together, searched for a Bradenton wedding photographer who could naturally document their wedding day. Some of the wedding photographer’s favorite memories of the night included the ambience of the nighttime, outdoor wedding reception and the emotion radiated off of the bride and groom. “I loved this wedding for many reasons: the mason jars hanging from the trees, the lights that lit up the dance floor and the night sky so perfectly, but above all, the emotion and the love that was surrounding Megan and Santi was so refreshing!” Kera gushed. We were looking for someone who could capture the moment and who took photos that had feeling to them, with great colors that were not over edited. We wanted pictures that we could look back on and remember the day, not just posed pics. Kera Photography was perfect. When I talked to Kera, she was cheerful and sweet, yet still had a calm way about her. I immediately knew that she and would be easy to work with. During our interview, she told me her background was in photojournalism, which cemented my decision. Her pictures are beautiful and real! Somewhere between rustic and romantic. We wanted our wedding to be beautiful, comfortable and fun. Outdoors we had open seating for mingling, corn hole boards, a life size jenga game, a candy table, a photo booth and for the kids, hula hoops and Frisbee’s. We hung about 300 mason jars with candles in them from the live oak trees to create a romantic feel and strung lights over the dance floor to invite people to dance the night away. We had a multitude of colors: grey, aqua, blue and purple. My mother and I went to the paint section and looked at swatches until we found some that we liked. I wanted them to complement each other, but not match.